of Guyana in a matter where the previous administration had taken away private lands on the Corentyne to construct the University of Guyana Berbice campus. The matter was filed in the High court on November 6, 2001 by attorney-at-law, Mursaline Bacchus, on behalf of applicants-The Berbice Bharati Saywah Sangha, a public company whose registered office is at Lot 10 Johns Port Mourant, Corentyne, Berbice, and other applicants- Jaikissoon Sukhdeo, Harold Lall Bahadur Singh, and Utille Burke, the Trustees of the Johnsville Senior Citizens’ Home. Attorney-at-law Bacchus based his application for redress on the Constitution of the Republic of Guyana, Chapter 1:01, citing the contravention of the applicant’s fundamental rights which is guaranteed by Articles 40, 142, 149 and 153 of the Constitution of the Republic of Guyana. The contention was in the manner of the compulsory acquisition by the Government of Guyana under the Acquisition of Lands for Public Purposes Act, Chapter 62:05. The previous PPP government had taken away the land called area ‘E’ being portion of Johns, Corentyne Coast, in Berbice. 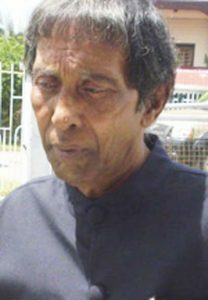 The administration had confiscated the land and erected the Berbice Campus. According to application the land was defined on a plan by Sworn Land Surveyor, I.S. Mohamed, dated August 24, 1965 and deposited in the Deeds Registry, Georgetown, on August 10, 1973. The matter finally came up before Justice Sandra Kurtzious in the Berbice High Court. It was first filed on November 6, 2001 and came up for hearing on the 28th day of September, 2016. The Judge after hearing Attorneys-at-Law for the Plaintiffs/Applicants and for the Defendant/Respondent and upon the evidence presented by the witnesses’ and after examination of the Acquisition of Lands for Public Purposes Act Chapter 62:05, granted judgment to the Plaintiffs/Applicants on the 24th of January, 2017; which was entered on the 6th February, 2017. The judge ordered and found that the Plaintiffs/Applicants are entitled to compensation. They were previously paid $3 million, thus the court ordered that the Plaintiffs/Applicants be paid the sum of $17.8 million as full and final compensation for the compulsory acquisition of their property. It was also ordered that interest on the said amount at six percent per annum be paid from the date of filing until the said sum is fully paid and satisfied. The Government was further ordered to the pay cost to the Plaintiff/Applicants in the sum of $75,000.